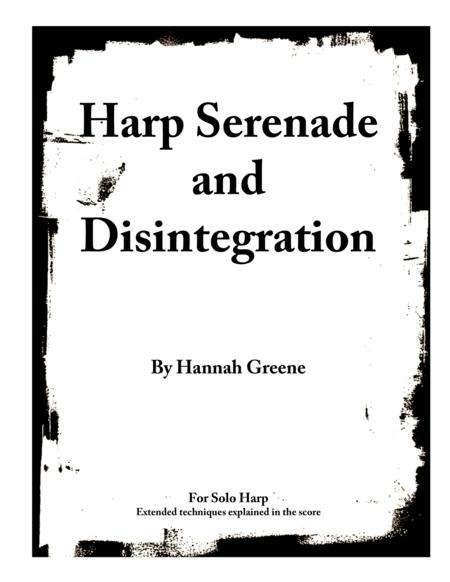 The "Harp Serenade and Disintegration" explores the many idiomatic sounds of the harp while exploring the diverse sounds it can create through extended techniques. "Serenade" focuses on melody and timbre with the extended technique of tapping on the soundboard as a main element. 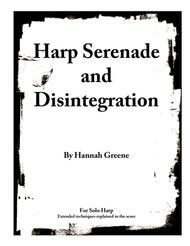 "Disintegration" mixes sounds and inspiration from Gershwin, Brubeck and Salzedo. The focus is on rhythm and glissandos. The piece is in a quasi-rondo form that unravels the melody and rhythmic refrain as the piece moves in time. The extended techniques used in "Disintegration" are soundboard tapping, harmonics, and vertical fingernail sliding up the strings.Premiered by Rebecca Moritzkyhttps://www.youtube.com/watch?v=EWRcZqEIN5w.